Go Greener premiered March 2010. These days, everywhere you turn just about everybody is talking about going green. Companies use national TV ads to tout their environmental credentials and promote their products as being green. But what does going green really mean? 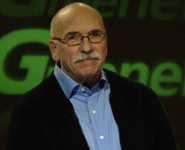 Morry Alter, GoGreener's host, is a 20-time Emmy-award winning journalist. Many people think that going green means living a life of deprivation or that it requires some extreme technology that is expensive, futuristic or complicated. It can leave you feeling a little overwhelmed. GoGreener looks at simple no and low-cost ways to make the most of the resources you use everyday while saving money doing it. The program explores practical things you can do to increase the efficiency of what you already have and reduce what you consume. For example with a few simple steps you can cut your electric bill by up to 20%. There's no radical change necessary, just little alterations in your daily routine at whatever pace is right for you. Whether you're motivated by saving money, reducing dependence on foreign energy and products, strengthening your local economy or preserving the land there are easy ways to go greener. And it doesn't matter if you live in a house or apartment, commute or work at home. You can be surrounded by forest, farmland, desert or concrete, there are many ways to save everyday. You will see that Going Greener is practical process, how do you make the best use of your money and resources. It all starts with the simple decisions we make everyday that when combined together can have a huge impact on our families and country. GoGreener host Susan Cheng works as an Environmental Educator with Cornell University Cooperative Extension NYC. Go Greener is guided by traditional, common sense, American values of thrift, innovation and self-reliance. Throughout this nearly one-hour PBS special you will meet people with some great practical solutioins. The program is hosted by 20-time Emmy award winning journalist Morry Alter and Susan Cheng of Cornell University's Cooperative Extension NYC. Recorded in front of a live audience, GoGreener incorporates field-produced segments featuring several dynamic innovators, as well as entertaining man-on-the-street comments that bring life to the topics. GoGreener is a Public Media Service production and is produced by Emmy-nominated PBS producer John Vernile, Peabody Award winning producer Paul Chuffo and Edward R. Murrow Award winning journalist Linda Sachs. Viewers will discover that "Going Greener" is not taxing or difficult, nor does it require a huge investment or involve a major lifestyle change. This program will dispel those myths. For more information about GoGreener ideas, home efficiency & financial incentives as well as GoGreener community forums please visit our main home at http://gogreener.org/. © 2015 Public Media Service, LLC. All Rights Reserved. Text by John Vernile. Photos courtesy of Public Media Service, LLC.